Dental Implants - Brooklyn, NY - Shawn Cohen, D.D.S. Dental implants are a wonderful solution for replacing missing teeth and to also provide a more permanent and fixed solution for denture wearers. The implants themselves support the dentures, whether this is a full or partial plate being worn. 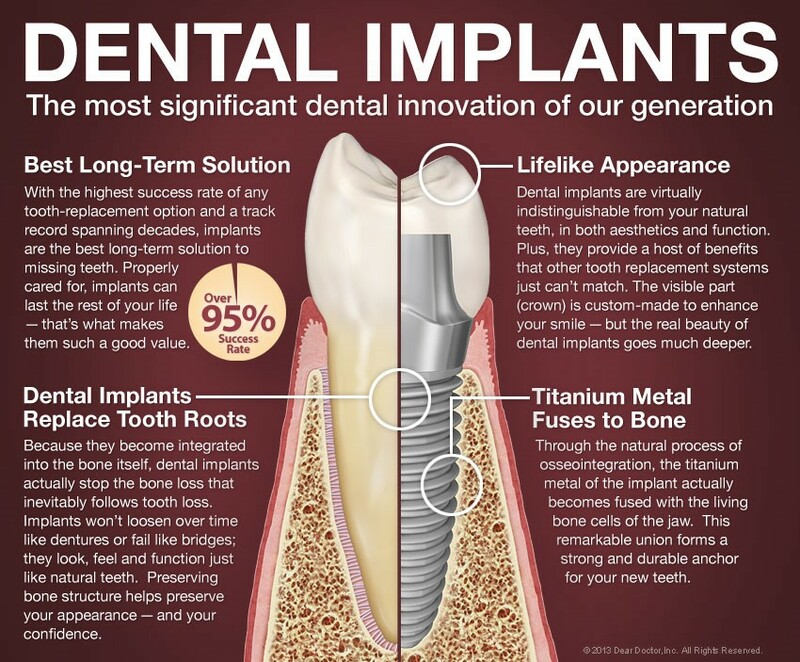 Think of dental implants as artificial roots made from metal, usually titanium. The small metal post is surgically placed into either the upper or lower jaw bone by the dental professional, who is either the dentist or the periodontist. Over the course of about three months, the metal post naturally fuses with the jaw bone and acts like any other tooth root in your mouth. The implant is used at the abutment for appliances to be placed on top, like a crown, bridge or full or partial dentures. When Should You Get a Dental Implant? It is important to have a consultation with us to ensure that you are a viable candidate for this procedure. We can give you a proper examination and work with you to see what treatment plan works best for you. Here are some reasons why people get dental implants. To securely hold dentures and partials in place so that they do not slip and are uncomfortable. The process of having an implant placed and healed can take several months. Before the procedure is started, x-rays and impressions are done to determine bone density, gum tissue quality and tooth spacing. During the procedure, the area that will receive the implant will be numb to ensure the surgery is comfortable for you. A small metal post is then placed into the gums and bone. Over the course of about three to six months, this metal post fuses with the jaw bone to create a strong hold for anything being placed on top of it like a crown or a bridge. Depending on the type of implant that was used, a second surgery may be needed to place the post, or abutment, that will hold the artificial tooth or be a post for the denture to be held. After a few weeks of healing, any artificial teeth will be made and fitted for this particular area. Permanent cement is used to securely place the crown on top of the abutment of the implant. If the implants are going to be used for dentures, the appliances need to be carefully and professionally filed down to accommodate the implants. After the procedure, you will receive thorough care instructions that will help you to not only heal properly, but to maintain an implant that lasts you for many years. Proper oral hygiene, eating habits and making routine trips to our office will ensure a long life for your new implants.